A Westminster Hall debate on the international students affected by the English Language test scandal will now take place on Tuesday 4 September. 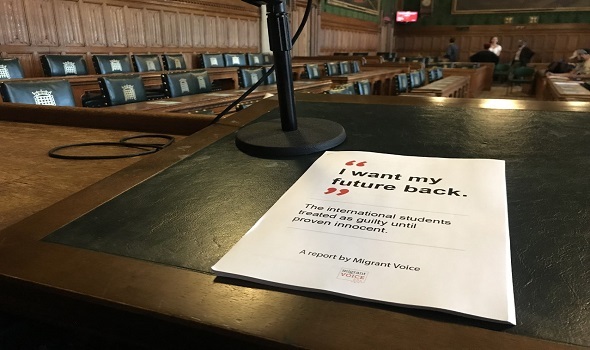 We are delighted with this development following the earlier promise of up to Eight MPs to press for a parliamentary debate in support of Migrant Voice’s campaign to clear the name of tens of thousands of international students accused of cheating by the Home Office. A member of the House of Lords, Baroness Uddin, joined the MPs – seven Labour and one Scottish National Party – in speaking out against the injustice at the launch of the campaign in Parliament on 10 July. Solicitors also addressed the meeting, which was organised by Migrant Voice and attended by more than 100 students, mostly from Bangladesh, India, Nepal and Pakistan. Speakers condemned the government’s response to a TV programme’s exposure four years ago of cheating in an English-language test: the Home Office collectively accused everyone who had taken the test over a three-year period. Several MPs at the launch described the Home Office clampdown – the students’ visas were immediately cancelled – as a “scandal” with “catastrophic consequences”. Others accused the government of making “deliberately misleading” statements about the issue. Labour MP Wes Streeting told the meeting: “This scandal is an under- looked injustice in this country that should be on the front page of every national newspaper, as for the Windrush scandal.” One speaker said the Home Office had deliberately tried to obstruct students’ attempts to clear their names. Labour MP Stephen Timms, who chaired the meeting, said it was unlikely a parliamentary debate could be held before September. Although the reply does not signify any change of policy, Timms is reportedly encouraged by the Minister’s answer, which at least suggests this controversy is a live issue. He intends to pursue the issue further during Question Time in Parliament next week. The Migrant Voice report, ‘I want my future back; International students found guilty until proven innocent’, was launched at the meeting.